Original SWAT Boots - 1150 Men's Classic 9"
Home > Original SWAT > Footwear > Mens Boots & Shoes > Boots - 1150 Men's Classic 9"
Original SWAT police boots are designed to give you the same comfort, fit and performance as a pair of sneakers. Original SWAT has done two very important things with the introduction of this line of of duty boots. First, by developing an all new 'last' - drawing heavily on European comfort footwear technology to get an orthotically correct shape. Second, by using modern materials and technology usually found in athletic footwear manufacture. The result is boots that have changed the uniform boot market. Original SWAT boots have forever set new standards in fit and comfort. 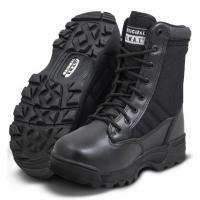 Outstanding, comfortable, and tactical boots. Great pair of boots, I never tock them off when I went camping, they served wonders for everything. ©2002-2019 CopsPlus.com: Original SWAT Boots - 1150 Men's Classic 9"